Adam started kayaking at the Burloak Canoe Club in Oakville in 1995 when he was 13 years old. Not a terribly gifted athlete, Adam started kayaking on the advice of his mother who saw an ad in the local newspaper for a recruitment drive which read Future Champions Wanted. At first the Burloak Canoe Club was just a great place to go after school, soon it was before school too, it wasn’t long before the Canoe Club felt like home. Kayaking allowed Adam’s strength as an individual to shine, and gave him the chance to develop as an athlete. Adam was Canada’s lone double medalist at the 2004 Athens Olympics at the young age of 22. Adam captured a gold medal with a victory in the K1 500m event one day after racing to a bronze in the K1 1000m. He was chosen as Canada’s Closing Ceremonies flag-bearer, and the 2004 Lou Marsh Award winner for Canadian Athlete of the year. In 2008 Adam carried the flag for Canada into the bird’s nest stadium at the summer Olympics in Beijing, China. 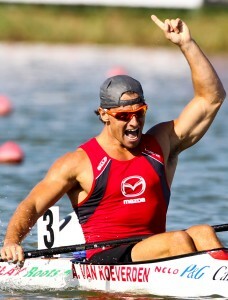 Adam aspired to be the first kayaker to ever defend a K1 500m Olympic title. But after breaking his own world-record in the heats, Adam was beaten in the final by his good friend Ken Wallace from Australia, to take the silver medal. Adam was given a Guinness Book World Record for the fastest 500m ever in a Canoe or Kayak. Another good friend, triathlete Simon Whitfield remarked that since he had chased down a German for gold in Sydney, and Adam chased down an Australian for gold in Athens, that it seemed like there was some kind of sweet poetry in those same two countries claiming gold in their two events in China. Adam was the World Champion again in 2011, this time in the 1000m event, winning by a huge margin of over 3 seconds. The commentator on Eurosport Live suggested the gap between 1st and 2nd could be timed “with a calendar”.Adam won a silver medal in the K1 1000m event in London, where his great friend and long time training partner, Eirik Veraas Larsen from Norway took the Gold, and his skiing buddy and favourite GA1 training mate, Max Hoff took the Bronze. The 2016 Rio Olympics were Adam’s fourth games. While it was his aspiration to win another Olympic medal, Adam failed to qualify for the A-final, winning the B, finishing in 9th. Following his race, Adam remarked how satisfied he was by his performance alone. “At this point in my career, my strokes were gratifying enough, and I don’t need a medal to validate my performance today”. Adam is an athlete ambassador for Right to Play, and the David Suzuki Foundation, as well as a National Spokesperson for Colon Cancer Canada. He has spoken on behalf of the World Wildlife Fund and at countless schools on the importance of healthy and active living, community involvement, and his experiences as a Canadian Olympian. Adam graduated Valedictorian of his class in 2007 from McMaster University, with an Honours Bachelor of Science degree in Kinesiology. Of all the doors now open to Adam, he notes the most important are the doors of schools, and sees his opportunity to affect positive change in Canada’s youth as his “most rewarding obligation” as a Canadian Olympian and public speaker.